Somerset Cup Match captain is quite confident of not only retaining the trophy for the Red and Blue but winning it outright on home ground. Somerset had dominated the Classic since 2012 when they won the Cup with an emphatic 10-wicket victory. 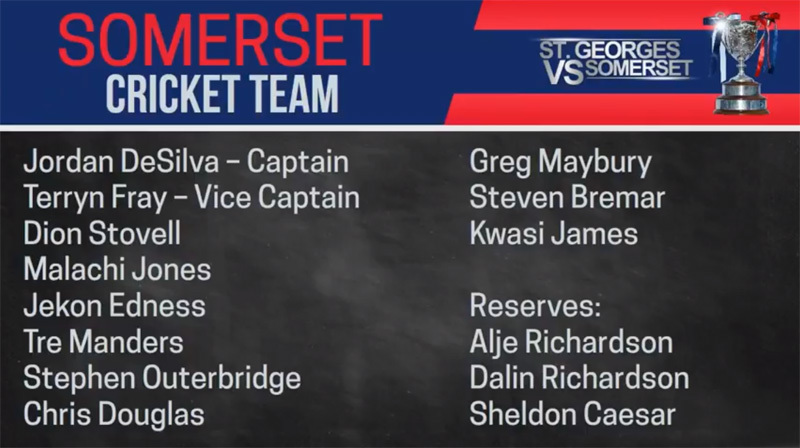 Since that win, they have mainly stayed with the same squad from year to year, and the 2018 edition is no different as Somerset have just two changes in their team as colts Steven Bremar Jr and Kwasi James will do their best to try to keep the Cup in the west end. They replace Derrick Brangman, who is serving a one-year suspension by the Bermuda Cricket Board, and Kamau Leverock who is in the UK plying his trade for Nottinghamshire. The Jordan DeSilva led squad will once again have Terryn Fray by his side as vice-captain. He also has a wide variety of options as Dion Stovell, Malachi Jones, Jekon Edness, Tre Manders, Stephen Outerbridge, Chris Douglas, and Greg Maybury are all back. DeSilva said Bremar and James were already being considered as additions to the team before the loss of Brangman and Leverock. DeSilva said it’s always great when Somerset can have a player of Leverock’s calibre in the squad as he is an exceptional cricketer. Somerset has held the Cup since 2012. If they hold onto it, one would have to go all the way back to 1931 through 1937 to the last time Somerset has had the bragging rights for seven years. The captain would love to do it in style with a victory. DeSilva said, “The game plan will be what it’s always been. We know we have to take 20 wickets to win the game. We’ve picked a team that will make it very difficult for St George’s to bowl us out twice. He said they now have that extra option in James. The Somerset captain says just because St George’s has four colts in its squad, that does not necessarily make his job easier. “We’ve seen colts in the past come out and perform,” DeSilva said. “Our last colt was Greg Maybury, and he got MVP as a colt in 2012, so we know that a colt doesn’t necessarily mean he’s going to be a weak link. DeSilva said that Somerset’s strength is in its batting. He pointed out that he has yet to bat twice in a Cup Match as the club is so strong from 1 to 11. He added: “We’re looking to win the match whether the wicket is conducive for batting or bowling. We’re looking to take advantage of the conditions whatever they may be come Thursday morning. I wish they would change the cricket to 2 40 over matches. Trying to play a test match in 2 days results in boring cricket most years, with the dominant incumbent team playing for a draw despite what they say to the media.